I first visited Budapest about three and a half years ago when my fiancé whisked me away there on a minibreak to celebrate getting back together. On that first visit I discovered quite how beautiful the city was, and thought it the perfect destination for a family get together to celebrate a milestone birthday (we don't mention numbers here). 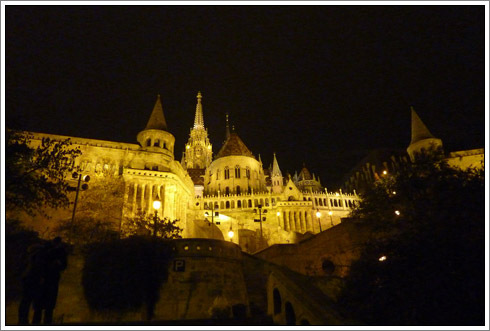 Budapest is a wonderful city with plenty to do at different times of year. In the early summer, we walked for miles soaking up the architecture and visited a very rickety Eastern European theme park with a wooden rollercoaster. In the winter, we wrapped up very warm, and also walked for miles. This time, however, there was the Christmas market to explore, and for those arriving a week later than we did, the largest frozen lake in Europe to skate on. I was gutted to miss that as I love ice skating. 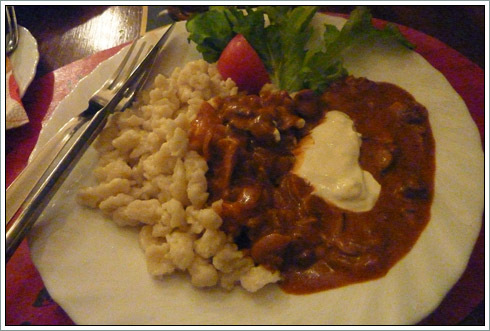 As a city, Budapest isn't particularly famous for its food, aside from its two main exports - paprika and goulash. But that's not to say there aren't some gems there. We visited four restaurants in our time there. One incredible, one good and homely, one bad and one where words fail me. I'll start with the bad. We were recommended this by the hotel we were staying in, and contrary to several highly complementary reviews on Tripadvisor, it wasn't an entirely positive experience. The ambiance was pleasant, with a couple of other large parties present in this cavernous cellar restaurant, and both the wines we ordered were excellent. However, things went downhill from this point. The menu was classic Hungarian, which was what we had set out to eat that night, and at first glance looked promising, if not a little dated. We eventually managed to order after trying to catch the waiter's eye for a good 40 minutes (2 bottles of wine down at this point) - not normally a problem, except that it wasn't busy and they weren't doing anything. As it was already late, we decided to forfeit getting a starter. I ordered a spinach and ricotta stuffed chicken with garlic pasta, as did my sister. My uncle and aunt ordered duck with mushrooms, and my mother and other aunt ordered the pike perch. A further 45 minutes after ordering (and a further bottle of wine sunk), our food finally arrived. My mother said her pike perch was virtually inedible, and my uncle and aunt commented that the duck was rather dry and flavourless. My chicken was similarly dry, and the "garlic pasta" was in fact, spagetti in tomato sauce with very little garlic to speak of. Edible, but very disappointing. It took us a further 40 minutes after asking for the bill for it to arrive. Vendeglo a Zsakbamacskahoz is not a restaurant I'd go back to however good the wine was, as both the food and service was lacking. Luckily, our party were full of celebratory spirit so it failed to dampen the mood. This was a pleasant surprise, and proof that you shouldn't always go into the first restaurant you see. I'm not normally one to eat in the "tourist-y" parts of town, but we were hungry and having eyed up the restaurant across the street, we decided to try our luck with this place. The name literally means "red devil restaurant", and when you see the cellar (which is only open in winter as it has a lovely courtyard) you can see why. There are red devils everywhere! Our party had split in two, and my uncle and aunt had gone off to see an old friend, so my mother, sister and I were left to our own devices. We took a taxi up to Buda, the old town, and wandered around. Not quite hungry, but slightly peckish and aware that it was lunchtime, we wandered into here. The waiter was charming and the restaurant itself, warm and cosy. As we were still full from the previous night's meal, we opted for their lunch special: a vegetarian mushroom stew served with little dumplings, which we rounded off with a local beer. The stew didn't look like much, but tasted wonderful. Hearty, warming and intensely mushroom-y. Perfect winter comfort food. Rounded off with a delicious (and very rich!) chocolate crepe, it was exactly what was needed for a winter lunch. The jewel in the crown of the holiday. I'm not sure I know where to begin with this one. "Oh wow" doesn't even begin to cover it. My sister and I wanted something special for my mother's birthday and she came across this restaurant. We booked it back in April, and it was already nearly full, so clearly we were onto a good thing. How good, we had no idea. Of the seven of us that ate there that night, all of us declared it "the best meal of my life". 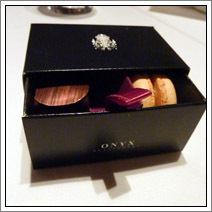 Onyx has recently been awarded its first Michelin star. If I had my way, I'd give it three. 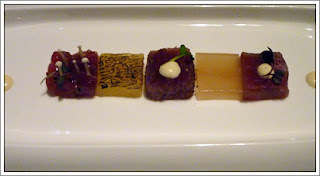 We went for the seven-course tasting menu with wine pairings. Extravagant, but, you know... needs must. I couldn't honestly pick a favourite dish. 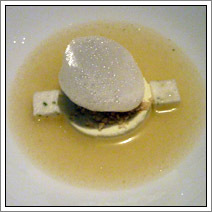 Everything was exquisitely prepared, the service was flawless - seemingly invisible and perfectly choreographed. 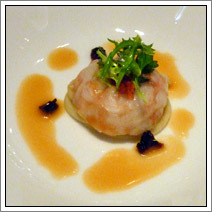 The quality of each and every course was wonderful and nothing jarred or seemed out of place. 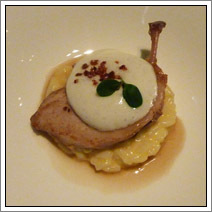 Getting the wine pairing was an inspired choice and made an already perfect meal, moreso. 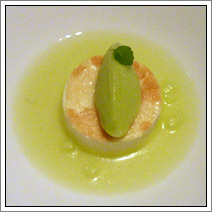 Perfection doesn't come cheap though - a seven course tasting menu plus wine pairing set us back around £100 a head. This actually seems very reasonable when you compare it to the cost of, say, Les Trois Garçons in Shoreditch, where a five course tasting menu with wine pairing comes to just over £100. 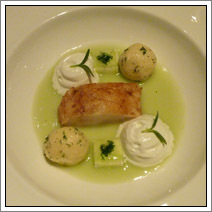 If you were visiting Budapest and wanted to eat somewhere truly special, I honestly couldn't recommend Onyx highly enough. The menus are well thought out and innovative, the quality of the food in excellent, service is flawless and it truly is a very special place to eat at. I've covered off the bad, the good and homely and the incredible. The final meal of the holiday was Fortuna. And... the experience was indescribable. Both painful and painfully funny. For our final meal, we had the choice of either eating here, or at Menza. Trust me on this one - we didn't go there, but go to Menza. 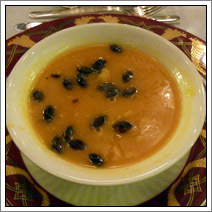 Fortuna came highly recommended via several sources. A Budapest local friend of my aunt's, and several Twitter recommendations. We checked it out earlier on in the day, and although the restaurant itself was closed as it operates in the evenings only, the menu looked promising and it looked chintzy, but welcoming. When we arrived at 8, we discovered we were the only people in the restaurant. More worrying however was that this was the way it would stay for the rest of the evening. Our waiter was over-attentive to the point of prescriptiveness and didn't so much recommend us food choices, but "advised" us that we should order certain dishes. Unperturbed, I went against recommendations and ordered what I felt like. Both dishes I chose sounded like safe bets. 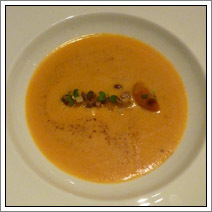 The pumpkin soup was delicate to the point of being watery, though the seeds were a nice touch and added some much-needed texture. My first thoguhts when the duck arrived, however, was being slightly overwhelmed by the size of the portion. 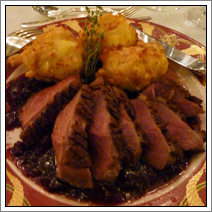 The duck, although rare, was tough, chewy and lacked flavour, while the potato dumplings were overwhelmingly stodgy. 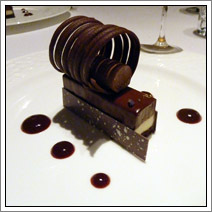 I was unable to finish it, and couldn't face the thought of dessert at this point. The rest of our party didn't fare much better. My fiancé said the goulash was similarly light on flavour, and my sister's "Fortuna salad" was mildly disappointing. My mum had a special vegetarian strudel made for her as a main course, which sounded enviably lovely and turned out to be sodden pastry, a couple of courgettes and an awful lot of celery. My aunt's milk-fed lamb was also disappointing - chewy and touch, which it really shouldn't have been. And that was just the food. The additional "entertainment" for the night was a traditional Hungarian gypsy band, who expected payment for their services at the end of the night. I know this is convention in a great many Eastern European restaurants, but when there's only seven diners, it's bound to be embarrassing for both parties when we don't want to tip for something that was painful to listen to. Have any of you readers been to Budapest? What did you think of the food? Do you have any horror stories or favourite restaurants? I've love to hear about them! The first meal looks like something you'd expect to be served in Pizza Hut. I really need to go to Budapest! You definitely need to go to Budapest - it's one of my favourite cities and I think you'd really like it. 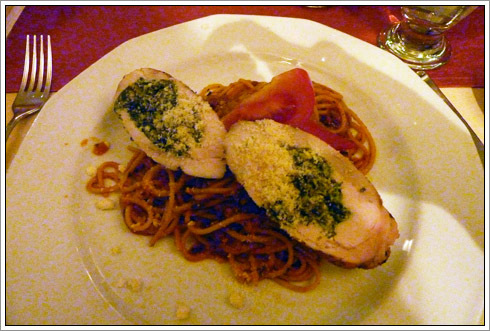 I had two days in Budapest during an interrailing trip in 2008 - we found Menza the first evening, had a great meal, and went back on the second evening. I hope it is still as good as it was in 2008. Highly recommended!